The city of Buckley is quite small, with less than 4,500 residents, but it is a popular choice for residents who enjoy a quaint, rural atmosphere outside the larger city. Buckley is part of Pierce County, known for its urban areas like Tacoma and Lakewood, but Buckley remains a peaceful community on the road to Mount Rainier. Like many of the suburbs in Pierce County, residents of Buckley usually work in the metro areas of Tacoma or Seattle; the average commute here is about 30 minutes. In the current market, the area is seeing more new constructed homes for sale, but there are still plenty of well-established homes to choose from, and keep your eyes peeled for those unique, luxury estates. 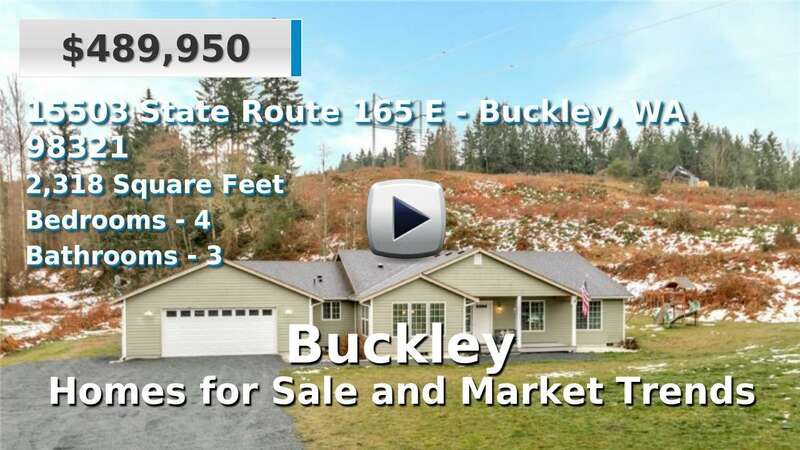 Home buyers will also find most listings are on larger than average-sized lots in the Buckley area. 3 Beds | 2 Baths | 1756 sq. Ft.
4 Beds | 2.5 Baths | 2445 sq. Ft.
2 Beds | 1.75 Baths | 1173 sq. Ft.
4 Beds | 2.5 Baths | 2464 sq. Ft.
2 Beds | 1.75 Baths | 1178 sq. Ft.
3 Beds | 2.5 Baths | 1909 sq. Ft.
4 Beds | 2.75 Baths | 3226 sq. Ft.
4 Beds | 3 Baths | 1970 sq. Ft.
3 Beds | 2.5 Baths | 2276 sq. Ft.
4 Beds | 2 Baths | 1944 sq. Ft.
4 Beds | 4.5 Baths | 5181 sq. Ft.
3 Beds | 2 Baths | 1890 sq. Ft.
3 Beds | 2.5 Baths | 2018 sq. Ft.
4 Beds | 2.5 Baths | 2239 sq. Ft.
3 Beds | 2.5 Baths | 2892 sq. Ft.
3 Beds | 2.5 Baths | 2406 sq. Ft.
4 Beds | 2 Baths | 1741 sq. Ft.